A crucial enzyme built from vitamin B3. Also known as co-enzyme 1. The most important enzyme in releasing energy in every cell of the body. NADH (Nicotinamide adenine dinucleotide - Reduced form) is the most important Coenzyme (also known, appropriately, as Coenzyme 1) in releasing energy in every cell of the body. The final stage of energy production creates a substance known as ATP. ATP easily and readily releases energy everywhere in the body where it is needed for all functions of the body, this includes energy to think, make hormones and activate muscles and so on. As we age and/or suffer from below par health or actual chronic disease we get locked into a downward spiral where a reduction in the ability of the cells to produce ATP occurs and that reduction causes more disease and poor health. NADH provides electrical energy via electron (attached to hydrogen) donation. It can therefore be regarded as donating active hydrogen directly into the cells mitochondria. This is the most important facilitator of the aforementioned process in producing ATP. This process also helps to support the utilisation of oxygen AND is said to have the most powerful anti-oxidant effect in the body. These aspects make NADH a prime remedy for health, longevity and freedom from chronic disease. Of course NADH is not the complete answer to health optimisation. Other nutrients found in foods, Superfoods and nutritional supplements are also needed. Other nutrients are involved in producing ATP in a complex process known as the Krebs cycle. However NADH is the highest energy provider in that cycle and even in cases of other enzymes lacking (for example co-enzyme Q10) NADH will help to produce ATP. A broad mixture of nutrients and enzymes as found in specialised yeast cells in Zell Immunocomplex also stimulate ATP and will work synergistically with NADH to further enhance the bodies core energy production. Use of both would most likely necessitate reducing the initial doses, as per the general rules of not increasing the bodies energies too fast (increase the dose over a few weeks). However this may not apply to those with very low energy such as the elderly with moderate to severe Parkinson's or Alzheimer's where the more help to wake up the Krebs cycle the better. NADH should take its rightful place as a potent support to any regenerative health regime alongside mineral and trace element supplementation, vitamins C, D; and where needed vitamin B12, further adding in Superfoods to provide a broad spectrum of phytonutrients. Electron donors have rapidly become more important within modern nutritional medicine. Electron donors provide our bodies with electrons. They strengthen the immune system, supply energy to our bodies (brain, cardiovascular system, muscular system), support regeneration processes and delay aging. Vitamins and enzymes are to be seen as the most important electron donors. Vitamin deficient nutrition, through an increased intake of pleasure products (alcohol, tobacco), permanent stress and high performance sport activities also increase the demand and utilization of electron donors. Deficits of electron donors lead to mental and physical loss of activity and accelerate the aging process. Biological electron donors can be described within this sphere of nutritional medicine as anti-oxidants (such as carotenoids, vitamin C and vitamin E). The strongest antioxidant in our body is NADH. NADH (short form for nicotinamide-adenine-dinucleotide) is a critical cofactor in hundreds of biochemical reactions associated with energy metabolism. NADH is the biologically active form of vitamin B3 (niacin). The extremely high activity of NADH however pays its price. NADH is very sensitive to light and oxygen and therefore very unstable. Consequently, until only a few years ago, it was possible to administer NADH only via injection. PANMOL®-NADH is stabilized by a natural process and is therefore orally administrable and stable for years. Finally an organic form of NADH is now available. 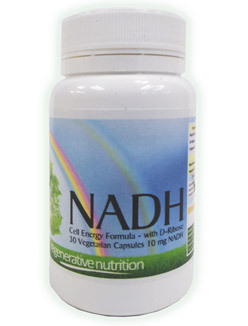 NADH is the coenzyme of various hydrogen transferring enzymes (dehydrogenases, oxidoreductases) and supports the regeneration of the brain, heart, vascular and muscle cells including the functions of the reproductive organs. The neurotransmitter dopamine deserves special consideration from a bio-psychological stand- point, as it is apparently important for several basic behavioral functions such as motivation, learning, psychomotility and attentiveness. NADH is the most powerful antioxidant present in the human body and fulfils a major role in the neutralisation of cytotoxic radicals and peroxides. Demonstrates reduced memory, concentration, performance, intellectual performance, alertness, attentiveness, heart function, muscle performance and reduced cell and tissue protection. * Stryer, L.: Biochemie. Spektrum Akademischer Verlag Heidelberg, Berlin, Oxford, 4. Auflage 1996, p. 557-587. ** Pelzmann, B. et al. : NADH -supplementation decreases pinacidil-primed IK(ATP) in ventricular cardiomyocytes via increase of intracellular ATP content. Br. J. Pharmacol. 139(4):749-54, 2003. *** Vrecko, K. et al. : Stimulation of dopamine biosynthesis in culture P12 pheochromocytoma cells by the coenzyme nicotinamide adenine dinucleotide (NADH). J. Neural. Transm. 5: 147-156, 1993. **** Kirsch, M. and De Groot, H.: NAD(P)H, a directly operating antioxidant? The FASEB Journal, 15: 1569-1574, 2001. During the middle of the last century NADH was successfully used as an injection to treat various neurological illnesses such as Parkinson’s disease, Alzheimer’s disease and also for late-onset dementia. Due to its chemical instability, injections always had to be freshly prepared. Although the central activating and stimulating characteristics of this biomolecule were identified 5 decades ago, broad usage of NADH, because of its highly sensitive and unstable molecular characteristics, was not possible. An oral application of NADH was totally out of the question, because the substance would have been destroyed immediately after ingestion through contact with gastric acid. At the turn of this century a Research Team of the vis vitalis-group / Austria, began to study the biochemical and biological characteristics of NADH. Through various ongoing comparison investigations with plant cells it was possible to identify a plant molecule that had similar characteristics to NADH: chlorophyll. If NADH is the strongest electron donor in humans, then chlorophyll is the plant ´s counterpart. After a series of research tests it was possible to combine NADH and chlorophyll in a manner that resulted in a natural stabilized NADH-complex. Therefore for the first time the highly active and highly sensitive biomolecule NADH was stabilised through combination with a natural element. After extensive tests at a second phase it became possible to coat the stable NADH/chlorophyll- complex with other natural substances – in particular plant fats and bees wax to form micro- capsules resistant to gastric acid. With this PANMOL®-NADH(MICRO) was born, a stabilised oral form of NADH that, for the first time, can also be combined with other biologically active ingredients. This means that the vitality of the human body depends, in the end, on the magnitude of the fraction of energy-rich electrons in food. NADH, for instance, ranks among the most important and energy-richest electron carriers in human metabolism because of its extremely low standard redox potential of -320 mV. NADH transfers electrons (a bound "hydride") to molecular respiratory oxygen primarily to recover energy (while simultaneously forming ATP). That reaction process - which is referred to as oxidative phosphorylation or respiratory chain-takes place in the mitochondria of the cells. Thus, NADH is, so to speak, symbolic of cellular energy. Supplementation studies with NADH have shown that NADH promotes cognitive, intellectual and motoric abilities in patients with Parkinson‘s disease and Alzheimer‘s disease as well as in those with fatigue, lethargy and chronic fatigue syndrome. NADH also enhances vitality and motivation, and occasionally has been reported to eliminate libido and potency disorders. Depression, learning difficulties and concentration can also be a consequence of limited endogenous NADH synthesis, as can reduced physical performance and stressful circumstances and during endurance sport. Last but not least, NADH promotes the synthetic and detoxicating functions of the liver. Based on its biochemical mode of action, NADH may promote cognitive function by indirectly increasing dopamine synthesis, decreasing mitochondrial dysfunction by helping to restore function of certain NADH-dependent mitochondrial enzymes that are closely linked to energy metabolism of neurons and by increasing energy production of the cells in the brain and periphery, which may lead to a higher capacity in their metabolic performance. There have been several experimental and animal studies published, suggesting that strenuous exercise correlates with levels of NADH. In an open label trial the dispersion of reaction times and the ergometric performance of seventeen competition level athletes (cyclists and long distance runners) have been examined before and 4 weeks after a daily supplementation of 5 mg of NADH. The dispersion of reaction times (DRT) became better and so did the quality and the speed of recognising symbols in a certain pattern. In 9 of the 17 athletes the continuous attention as well as the maximum performance did improve. Dysfunction of the blood vessels, particularly the endothelium, may result from increased production of free radicals and decreased availability of the endothelial derived relaxing factor nitric oxide (NO) either so comprised synthesis, release or its activity. Lack of NO contributes to impaired blood vessel relaxation, platelet aggregation, enhanced leucocyte adhesion to the endothelium, and increased blood pressure. A double-blind, placebo-controlled study with spontaneously hypertensive rats (SHR) investigated the effects of oral NADH on blood pressure. Accordingly, supplementation with the natural coenzyme NADH theoretically could prove to be useful in preventing age-related increases in BP and, thus, various cardiovascular maladies. Rösler, D. et al. : Influence of a combination of NADH-Vitamin B-Complex and Magnesium – on memory, concentration and mood. Accepted OM & Ernährung, 2008. Depression and dementia represent two of the most important diseases in advanced age. The positive influence of particular nutrients such as NADH, B-vitamins and various trace elements is well documented in this connection. The aim of this study was to test the influence of a complex nutritional supplement on memory, concentration and mood. Methods: The Hamilton Depression Scale (HAMD-17) was used for investigating the parameter depression. In order to quantify dementia (divided into memory achievement and attention), the Syndrome Short Test (SKT) was used. The study was designed as a double-blind, placebo- controlled, prospective trial. Results: Within three months 28 residents of nursing homes (24 women, 4 men) of the age range 49-94 years (78.39 ± 9.19 years) could be included in the study. The verum group showed a significant improvement of depressive symptomatology (p = 0.049) in the comparison to placebo group. With regard to the memory and attention parameters, a clear benefit for the supplemented group also resulted. Conclusion: This study could document a beneficial effect of the nutritional supplement on the examined parameters dementia and depression. A clinical study of 205 depressed people showed that 93% of those reported a lessening of depression of up to 44% from taking 10 mg of NADH daily over a period of 310 days. Dr. Birkmayer recommends the higher dose of 20mg NADH daily and suggests it would provide higher level of benefits to depressed patients including improved energy. NADH is compatible with any medication so combined use is acceptable. Forsyth, L.M. et al. : Therapeutic effects of oral NADH on the symptoms of patients with chronic fatigue syndrome. Ann Allergy Asthma Immunol. 1999 Feb;82(2):185-91. Chronic fatigue syndrome (CFS) is a disorder of unknown etiology, consisting of prolonged, debilitating fatigue and a multitude of symptoms including neurocognitive dys- function, flu-like symptoms, myalgia, weakness, arthralgia, low-grade fever, sore throat, head- ache, sleep disturbances and swelling and tenderness of lymph nodes. No effective treatment for CFS is known. The purpose of the study was to evaluate the efficacy of the reduced form of nicotinamide adenine dinucleotide (NADH) i.e., ENADA the stabilized oral absorbable form, in a randomized, double-blind, placebo-controlled crossover study in patients with CFS. Nicotinamide adenine dinucleotide is known to trigger energy production through ATP generation which may form the basis of its potential effects. Methods: Twenty-six eligible patients who fulfilled the Center for Disease Control and Prevention criteria for CFS completed the study. Medical history, physical examination, laboratory studies, and questionnaire were obtained at baseline, 4, 8, and 12 weeks. Subjects were randomly assigned to receive either 10 mg of NADH or placebo for a 4-week period. Following a 4-week washout period, subjects were crossed to the alternate regimen for a final 4-week period. Results: No severe adverse effects related to the study drug were observed. Within this cohort of 26 patients, 8 of 26 (31%) responded favorably to NADH in contrast to 2 of 26 (8%) to placebo. Based upon these encouraging results we have decided to conduct an open-label study in a larger cohort of patients. Another clinical study preformed via the Georgetown university medical center found that 72% of patients taking 10 mg of NADH a day achieved improvements in their condition. Dr Birkmayer suggests chronic fatigue patients take 60 – 80 mg NADH daily to receive the best overall results in a reasonable time period. Some of those taking just 10mg daily may take many months to see an improvement, whereas at the higher doses recommended improvements are normally quicker. Demarin, V. et al. : Treatment of Alzheimer‘s disease with stabilized oral nicotinamide adenine dinucleotide: a randomized, double-blind study. Drugs Exp Clin Res. 2004;30(1):27-33. This study was designed to evaluate the effect of stabilized oral reduced nicotinamide adenine dinucleotide (NADH) on cognitive functioning in patients with Alzheimer‘s disease (AD). NADH is a coenzyme that plays a key role in cellular energy production and stimulates dopamine production. In previous trials NADH has been shown to improve cognitive functioning in patients with Parkinson‘s disease, depression and AD. The present trial was a randomized, placebo- controlled, matched-pairs, double-blind, 6-month clinical study. Patients with probable AD (n = 26) were randomized to receive either stabilized oral NADH (10 mg/day) or placebo. Twelve pairs of subjects were matched for age and baseline total score on the Mattis Dementia Rating Scale (MDRS) and the Mini Mental State Examination. After 6 months of treatment, subjects treated with NADH showed no evidence of progressive cognitive deterioration and had significantly higher total scores on the MDRS compared with subjects treated with placebo (p < 0.05). Analysis of MDRS subscales revealed significantly better performance by NADH subjects on measures of verbal fluency (p = 0.019), visual-constructional ability (p = 0.038) and a trend (p = 0.08) to better performance on a measure of abstract verbal reasoning. There were no differences between groups in measures of attention, memory, or in clinician ratings of dementia severity (Clinical Dementia Rating). Consistent with earlier studies, the present findings support NADH as a treatment for Alzheimer‘s disease. Another study on those with Alzheimer's undertaken by Georgetown University medical center (approved trial by FDA) found that 10 mg daily of NADH resulted in 100% halt in the progress of the disease over a 6 month period. There where also significant improvements in mental functioning as ascertained by standard assessment tests for Alzheimer's. Dr, Birkmayer suggested that higher doses of NADH would be even more effective, e.g 40mg or higher dose of NADH. The other two major natural remedies for Alzheimer's are Vitamin B12 methylcolbalamin and coconut oil. Birkmayer, J.G. : Nicotinamide adenine dinucleotide (NADH)--a new therapeutic approach to Parkinson‘s disease. Comparison of oral and parenteral application. Acta Neurol Scand Suppl. 1993;146:32-5. The reduced coenzyme nicotinamide adenine dinucleotide (NADH) was used as medication in 885 parkinsonian patients in an open label trial. About half of the patients received NADH by intravenous infusion, the other half received capsules, orally. In about 80% of the patients a beneficial clinical effect was observed: 19.3% of the patients showed a very good (30-50%) improvement of disability, 58.8% a moderate (10-30%) improvement. 21.8% did not respond to NADH. Younger patients and patients with a shorter duration of disease have a better chance of gaining a marked improvement than older patients and patients who have had the disease longer. The orally administered form of NADH was associated with an overall improvement in the disability which was comparable to that of the parenterally (injection) applied form. NADH has been used in Europe to successfully treat more than 3,000 Parkinson's patients. In 1966 Humphry Osmond and I reported (1) that NAD was therapeutic for schizophrenic patients treated in a psychiatric wing of the University Hospital at Saskatoon. We used an enteric coated tablet containing 100 mg suspended in an oily medium to bypass the stomach. Patients who were responding slowly to vitamin B3 in doses of 3 grams daily, responded much more quickly to NAD using 1 gram daily. For as long as the NAD was available, they remained well or much improved. When we ran out of supplies they quickly relapsed. Two negative attempts were made to repeat our work using a preparation which was dumped into the stomach of patients who had been maintained on the backwards of the mental hospitals of that era and were sick for many years. These two negative reports effectively quenched interest in this compound until a few years ago. Professor J.G.D. Birkmayer and his associates at the Birkmayer Institute for Parkinson Therapy in Vienna, Austria, studied a stable form of NADH. They found that their stable preparation using 5 mg doses was therapeutic for Parkinson's disease, for Alzheimer's, and for depression. They wrote, "When we first used NADH with regard to its clinical efficacy the effect was not convincing". This was most likely due to the rapid dissolution (approximately 10-15 minutes) of the capsule leading to a release of NADH into the acid conditions of the stomach. Since NADH is rapidly oxidized below pH 7.6, the conditions in the stomach will inactivate NADH by converting it to NAD. The investigations of this report were therefore performed with NADH capsules coated with an acid stable film and a release time of 2-3 hours. With this galenic formulation of NADH an improvement in disability could be achieved which was comparable to that of intravenously applied NADH." NAD and NADH are interconvertible in the body. This suggests that the active form is the reduced form, NADH, and that NAD is much less effective since it would first have to be reduced to NADH. The decreasing order of therapeutic efficacy would be NADH, NAD and finally vitamin B3. There would be no formation of NADH in the stomach from NAD, but there would be some made in the intestine. NADH is a natural candidate as part of an anti-aging regime. This is due to it's ability to initiate repair of damaged cells, increase life span of cells and provide enhanced levels of energy via ATP especially in the elderly. NADH is non-toxic and can be tolerated at thousands of times the daily dose with almost no side effects. The body will only use as much of NADH as required for efficient cell function and energy release. Cancer thrives in a low oxygen and low ATP environment. It is therefore no surprise than NADH is one more important agent in enabling the remission of cancer. The primary cause of (all types of) cancer is the replacement of oxygen in cells during normal cellular respiration. Oxygen is replaced with the fermentation of sugar during cancer.